A couple of years ago Imandain was a promising new addition to the British death doom scene until they all but vanished some 7 years ago. Then out of the blue comes this new EP that holds some of the strongest material they’ve yet written. The last thing we heard of you was the wonderful Bethlehem tribute you did with Ataraxie way back in 2009. What happened in those silent years? 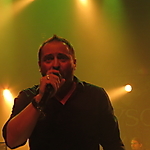 After a major line-up change the band eventually split in 2010. What brought you back together then after 8 years? It’s important to explain that “The Enemy of Fetters and the Dweller in the Woods” is made up of material that was intended for the second Imindain album which was partly composed around the period of the split with Ataraxie and slightly afterwards by that line-up. Some demos and live recordings of those songs had lay around gathering dust, and we agreed that in their present state they were wasted potential and deserved a real recording. We knew the interest would be limited as Imindain have never been a popular or fashionable band, but the time seemed right for us personally to do it. Do you feel Imindain anno 2017 is a new entity as such or simply a continuation? The reformed Imindain are a three piece and not all members are original. As I explained previously the EP is made up of older material but re-arranged by the current incarnation, so it is both a continuation and rebirth. Previously the solos and melodies were composed with a strict “less is more” attitude but this time it seemed more appropriate to take a more expressive, less restrained route. To retain a flowing, natural feel that all the solos and melodies were recorded in single takes with everything including mistakes left in. With regards to the vocals we decided to not allow ourselves to be restrained by what could or couldn’t be executed live as that wasn’t a factor to be taken into consideration. This left us with room to experiment as much as we could with layering, in all honesty I wish we hadn’t imposed such restrictions on earlier recordings as I think the results are fantastic. The keyboards are also a nice touch. They remind me a bit of old Vangelis work from the eighties actually? We also wanted to expand the role of the keyboards from what they were on previous releases without resorting to tasteless over-orchestration or banal gothic clichés. Vangelis but particularly Popol Vuh, and Tangerine Dream are major influences in that area. The title is quite a mouthful. What does it refer too? It’s a quote from “Thus Spoke Zarathustra” by Friedrich Nietzsche. The underlying concept of the EP is of the rejection and spiritual transcendence beyond the confines of society. It’s a statement of defiance against the confines of our society that imposes financial enslavement and the stunting of intellectual and spiritual advance. You’ve also included a cover of a classic Disembowelment track. I can imagine they were a big influence on you? Have you heard their newer material as Inverloch? “Transcendence into the Peripheral” is one of the few totally flawless albums to exist; it’s a milestone of the genre and something that was never repeated. They are a huge influence on us and we wanted to pay tribute to them. Musically we chose to combine our favorite elements of both the versions on “Dusk” and “Transcendence…” whilst putting our own personal touch to it as well. I really liked Inverloch’s “Dusk | Subside” EP but I’ve not spent enough time with the full length to feel like I can give an informed opinion yet. I don’t think they have the atmosphere or character of Disembowelment, but the song writing is still strong. Can we expect anything more in the near future as a full length or so? No, this EP was a one off release. The intention behind it was to give those remaining songs the recording they deserved and to create something which we felt was a definitive statement as to what Imindain stood for musically and philosophically. Any plans for a tour across the pond in Belgium or so? There are no plans to play live at all.